What are the legal consequences arising from the construction of the wall being built by Israel, the occupying Power, in the Occupied Palestinian Territory, including in and around East Jerusalem, as described in the report of the Secretary-General, considering the rules and principles of international law, including the Fourth Geneva Convention of 1949, and relevant Security Council and General Assembly resolutions? As explained in paragraph 82 below, the “wall” in question is a complex construction, so that that term cannot be understood in a limited physical sense. However, the other terms used, either by Israel (“fence”) or by the Secretary-General (“barrier”), are no more accurate if understood in the physical sense. In this Opinion, the Court has therefore chosen to use the terminology employed by the General Assembly. The Court notes furthermore that the request of the General Assembly concerns the legal consequences of the wall being built “in the Occupied Palestinian Territory, including in and around East Jerusalem”. As also explained below (see paragraphs 78-84 below), some parts of the complex are being built, or are planned to be built, on the territory of Israel itself; the Court does not consider that it is called upon to examine the legal consequences arising from the construction of those parts of the wall. In 1947 the United Kingdom announced its intention to complete evacuation of the mandated territory by 1 August 1948, subsequently advancing that date to 15 May 1948. In the meantime, the General Assembly had on 29 November 1947 adopted resolution 181 (II) on the future government of Palestine, which “Recommends to the United Kingdom ... and to all other Members of the United Nations the adoption and implementation ... of the Plan of Partition” of the territory, as set forth in the resolution, between two independent States, one Arab, the other Jewish, as well as the creation of a special international régime for the City of Jerusalem. The Arab population of Palestine and the Arab States rejected this plan, contending that it was unbalanced; on 14 May 1948, Israel proclaimed its independence on the strength of the General Assembly resolution; armed conflict then broke out between Israel and a number of Arab States and the Plan of Partition was not implemented. In the 1967 armed conflict, Israeli forces occupied all the territories which had constituted Palestine under British Mandate (including those known as the West Bank, lying to the east of the Green Line). On 22 November 1967, the Security Council unanimously adopted resolution 242 (1967), which emphasized the inadmissibility of acquisition of territory by war and called for the “Withdrawal of Israel armed forces from territories occupied in the recent conflict”, and “Termination of all claims or states of belligerency”. “all legislative and administrative actions taken by Israel to change the status of the City of Jerusalem, including expropriation of land and properties, transfer of populations and legislation aimed at the incorporation of the occupied section, are totally invalid and cannot change that status”. Later, following the adoption by Israel on 30 July 1980 of the Basic Law making Jerusalem the “complete and united” capital of Israel, the Security Council, by resolution 478 (1980) of 20 August 1980, stated that the enactment of that Law constituted a violation of international law and that “all legislative and administrative measures and actions taken by Israel, the occupying Power, which have altered or purport to alter the character and status of the Holy City of Jerusalem . . . are null and void”. It further decided “not to recognize the ‘basic law’ and such other actions by Israel that, as a result of this law, seek to alter the character and status of Jerusalem”. Lastly, a number of agreements have been signed since 1993 between Israel and the Palestine Liberation Organization imposing various obligations on each party. Those agreements inter alia required Israel to transfer to Palestinian authorities certain powers and responsibilities exercised in the Occupied Palestinian Territory by its military authorities and civil administration. Such transfers have taken place, but, as a result of subsequent events, they remained partial and limited. The Court would observe that, under customary international law as reflected (see paragraph 89 below) in Article 42 of the Regulations Respecting the Laws and Customs of War on Land annexed to the Fourth Hague Convention of 18 October 1907 (hereinafter “the Hague Regulations of 1907”), territory is considered occupied when it is actually placed under the authority of the hostile army, and the occupation extends only to the territory where such authority has been established and can be exercised. The territories situated between the Green Line (see paragraph 72 above) and the former eastern boundary of Palestine under the Mandate were occupied by Israel in 1967 during the armed conflict between Israel and Jordan. Under customary international law, these were therefore occupied territories in which Israel had the status of occupying Power. Subsequent events in these territories, as described in paragraphs 75 to 77 above, have done nothing to alter this situation. All these territories (including East Jerusalem) remain occupied territories and Israel has continued to have the status of occupying Power. The report of the Secretary-General states that “The Government of Israel has since 1996 considered plans to halt infiltration into Israel from the central and northern West Bank ...” (Para. 4.) According to that report, a plan of this type was approved for the first time by the Israeli Cabinet in July 2001. Then, on 14 April 2002, the Cabinet adopted a decision for the construction of works, forming what Israel describes as a “security fence”, 80 kilometres in length, in three areas of the West Bank. According to the Written Statement of the Secretary-General, the first part of these works (Phase A), which ultimately extends for a distance of 150 kilometres, was declared completed on 31 July 2003. It is reported that approximately 56,000 Palestinians would be encompassed in enclaves. During this phase, two sections totalling 19.5 kilometres were built around Jerusalem. In November 2003 construction of a new section was begun along the Green Line to the west of the Nazlat Issa-Baqa al-Sharqiya enclave, which in January 2004 was close to completion at the time when the Secretary-General submitted his Written Statement. As at 25 January 2004, according to the Written Statement of the Secretary- General, some 190 kilometres of construction had been completed, covering Phase A and the greater part of Phase B. Further construction in Phase C had begun in certain areas of the central West Bank and in Jerusalem. Phase D, planned for the southern part of the West Bank, had not yet begun. The Israeli Government has explained that the routes and timetable as described above are subject to modification. In February 2004, for example, an 8-kilometre section near the town of Baqa al-Sharqiya was demolished, and the planned length of the wall appears to have been slightly reduced. a stack of six coils of barbed wire marking the perimeter of the complex. The complex has a width of 50 to 70 metres, increasing to as much as 100 metres in some places. “Depth barriers” may be added to these works. The approximately 180 kilometres of the complex completed or under construction as of the time when the Secretary-General submitted his report included some 8.5 kilometres of concrete wall. These are generally found where Palestinian population centres are close to or abut Israel (such as near Qalqiliya and Tulkarm or in parts of Jerusalem). According to the report of the Secretary-General, in its northernmost part, the wall as completed or under construction barely deviates from the Green Line. It nevertheless lies within occupied territories for most of its course. The works deviate more than 7.5 kilometres from the Green Line in certain places to encompass settlements, while encircling Palestinian population areas. A stretch of 1 to 2 kilometres west of Tulkarm appears to run on the Israeli side of the Green Line. Elsewhere, on the other hand, the planned route would deviate eastward by up to 22 kilometres. In the case of Jerusalem, the existing works and the planned route lie well beyond the Green Line and even in some cases beyond the eastern municipal boundary of Jerusalem as fixed by Israel. On the basis of that route, approximately 975 square kilometres (or 16.6 per cent of the West Bank) would, according to the report of the Secretary-General, lie between the Green Line and the wall. This area is stated to be home to 237,000 Palestinians. If the full wall were completed as planned, another 160,000 Palestinians would live in almost completely encircled communities, described as enclaves in the report. As a result of the planned route, nearly 320,000 Israeli settlers (of whom 178,000 in East Jerusalem) would be living in the area between the Green Line and the wall. Lastly, it should be noted that the construction of the wall has been accompanied by the creation of a new administrative régime. 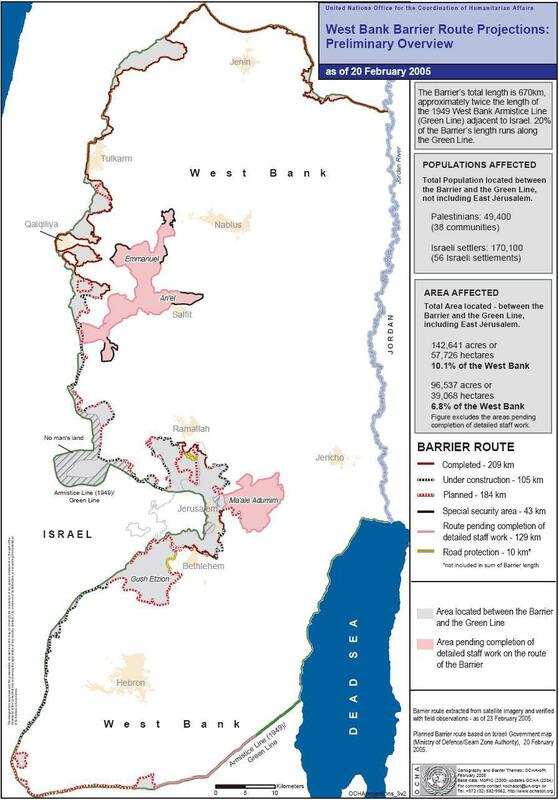 Thus in October 2003 the Israeli Defence Forces issued Orders establishing the part of the West Bank lying between the Green Line and the wall as a “Closed Area”. Residents of this area may no longer remain in it, nor may non-residents enter it, unless holding a permit or identity card issued by the Israeli authorities. According to the report of the Secretary-General, most residents have received permits for a limited period. Israeli citizens, Israeli permanent residents and those eligible to immigrate to Israel in accordance with the Law of Return may remain in, or move freely to, from and within the Closed Area without a permit. Access to and exit from the Closed Area can only be made through access gates, which are opened infrequently and for short periods. The Court will now determine the rules and principles of international law which are relevant in assessing the legality of the measures taken by Israel. Such rules and principles can be found in the United Nations Charter and certain other treaties, in customary international law and in the relevant resolutions adopted pursuant to the Charter by the General Assembly and the Security Council. However, doubts have been expressed by Israel as to the applicability in the Occupied Palestinian Territory of certain rules of international humanitarian law and human rights instruments. The Court will now consider these various questions. As regards international humanitarian law, the Court would first note that Israel is not a party to the Fourth Hague Convention of 1907, to which the Hague Regulations are annexed. The Court observes that, in the words of the Convention, those Regulations were prepared “to revise the general laws and customs of war” existing at that time. Since then, however, the International Military Tribunal of Nuremberg has found that the “rules laid down in the Convention were recognised by all civilised nations, and were regarded as being declaratory of the laws and customs of war” [...]. The Court itself reached the same conclusion when examining the rights and duties of belligerents in their conduct of military operations (Legality of the Threat or Use of Nuclear Weapons, Advisory Opinion, I.C.J. Reports 1996 (I), p. 256, para. 75). The Court considers that the provisions of the Hague Regulations have become part of customary law, as is in fact recognized by all the participants in the proceedings before the Court. The Court also observes that, pursuant to Article 154 of the Fourth Geneva Convention, that Convention is supplementary to Sections II and III of the Hague Regulations. Section III of those Regulations, which concerns “Military authority over the territory of the hostile State”, is particularly pertinent in the present case. Secondly, with regard to the Fourth Geneva Convention, differing views have been expressed by the participants in these proceedings. Israel, contrary to the great majority of the other participants, disputes the applicability de jure of the Convention to the Occupied Palestinian Territory. In particular, in paragraph 3 of Annex I to the report of the Secretary-General, entitled “Summary Legal Position of the Government of Israel”, it is stated that Israel does not agree that the Fourth Geneva Convention “is applicable to the occupied Palestinian Territory”, citing “the lack of recognition of the territory as sovereign prior to its annexation by Jordan and Egypt” and inferring that it is “not a territory of a High Contracting Party as required by the Convention”. The Court would recall that the Fourth Geneva Convention was ratified by Israel on 6 July 1951 and that Israel is a party to that Convention. Jordan has also been a party thereto since 29 May 1951. Neither of the two States has made any reservation that would be pertinent to the present proceedings. Furthermore, Palestine gave a unilateral undertaking, by declaration of 7 June 1982, to apply the Fourth Geneva Convention. Switzerland, as depositary State, considered that unilateral undertaking valid. It concluded, however, that it “[was] not as a depositary in a position to decide whether” “the request [dated 14 June 1989] from the Palestine Liberation Movement in the name of the ‘State of Palestine’ to accede” inter alia to the Fourth Geneva Convention “can be considered as an instrument of accession”. Subsequently, the Israeli authorities have indicated on a number of occasions that in fact they generally apply the humanitarian provisions of the Fourth Geneva Convention within the occupied territories. However, according to Israel’s position as briefly recalled in paragraph 90 above, that Convention is not applicable de jure within those territories because, under Article 2, paragraph 2, it applies only in the case of occupation of territories falling under the sovereignty of a High Contracting Party involved in an armed conflict. Israel explains that Jordan was admittedly a party to the Fourth Geneva Convention in 1967, and that an armed conflict broke out at that time between Israel and Jordan, but it goes on to observe that the territories occupied by Israel subsequent to that conflict had not previously fallen under Jordanian sovereignty. It infers from this that that Convention is not applicable de jure in those territories. According however to the great majority of other participants in the proceedings, the Fourth Geneva Convention is applicable to those territories pursuant to Article 2, paragraph 1, whether or not Jordan had any rights in respect thereof prior to 1967. The Court notes that, according to the first paragraph of Article 2 of the Fourth Geneva Convention, that Convention is applicable when two conditions are fulfilled: that there exists an armed conflict (whether or not a state of war has been recognized); and that the conflict has arisen between two contracting parties. If those two conditions are satisfied, the Convention applies, in particular, in any territory occupied in the course of the conflict by one of the contracting parties. The object of the second paragraph of Article 2 is not to restrict the scope of application of the Convention, as defined by the first paragraph, by excluding therefrom territories not falling under the sovereignty of one of the contracting parties. It is directed simply to making it clear that, even if occupation effected during the conflict met no armed resistance, the Convention is still applicable. This interpretation reflects the intention of the drafters of the Fourth Geneva Convention to protect civilians who find themselves, in whatever way, in the hands of the occupying Power. Whilst the drafters of the Hague Regulations of 1907 were as much concerned with protecting the rights of a State whose territory is occupied, as with protecting the inhabitants of that territory, the drafters of the Fourth Geneva Convention sought to guarantee the protection of civilians in time of war, regardless of the status of the occupied territories, as is shown by Article 47 of the Convention. That interpretation is confirmed by the Convention’s travaux préparatoires. The Conference of Government Experts convened by the International Committee of the Red Cross (hereinafter, “ICRC”) in the aftermath of the Second World War for the purpose of preparing the new Geneva Conventions recommended that these conventions be applicable to any armed conflict “whether [it] is or is not recognized as a state of war by the parties” and “in cases of occupation of territories in the absence of any state of war” (Report on the Work of the Conference of Government Experts for the Study of the Conventions for the Protection of War Victims, Geneva, 14-26 April 1947, p. 8). The drafters of the second paragraph of Article 2 thus had no intention, when they inserted that paragraph into the Convention, of restricting the latter’s scope of application. They were merely seeking to provide for cases of occupation without combat, such as the occupation of Bohemia and Moravia by Germany in 1939. The Court would moreover note that the States parties to the Fourth Geneva Convention approved that interpretation at their Conference on 15 July 1999. They issued a statement in which they “reaffirmed the applicability of the Fourth Geneva Convention to the Occupied Palestinian Territory, including East Jerusalem”. Subsequently, on 5 December 2001, the High Contracting Parties, referring in particular to Article 1 of the Fourth Geneva Convention of 1949, once again reaffirmed the “applicability of the Fourth Geneva Convention to the Occupied Palestinian Territory, including East Jerusalem”. They further reminded the Contracting Parties participating in the Conference, the parties to the conflict, and the State of Israel as occupying Power, of their respective obligations. 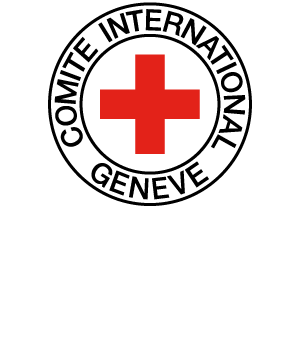 Moreover, the Court would observe that the ICRC, whose special position with respect to execution of the Fourth Geneva Convention must be “recognized and respected at all times” by the parties pursuant to Article 142 of the Convention, has also expressed its opinion on the interpretation to be given to the Convention. In a declaration of 5 December 2001, it recalled that “the ICRC has always affirmed the de jure applicability of the Fourth Geneva Convention to the territories occupied since 1967 by the State of Israel, including East Jerusalem”. On 20 December 1990, the Security Council, in resolution 681 (1990), urged “the Government of Israel to accept the de jure applicability of the Fourth Geneva Convention ... to all the territories occupied by Israel since 1967 and to abide scrupulously by the provisions of the Convention”. It further called upon “the High Contracting Parties to the said Fourth Geneva Convention to ensure respect by Israel, the occupying Power, for its obligations under the Convention in accordance with article 1 thereof”. Lastly, in resolutions 799 (1992) of 18 December 1992 and 904 (1994) of 18 March 1994, the Security Council reaffirmed its position concerning the applicability of the Fourth Geneva Convention in the occupied territories. In view of the foregoing, the Court considers that the Fourth Geneva Convention is applicable in any occupied territory in the event of an armed conflict arising between two or more High Contracting Parties. Israel and Jordan were parties to that Convention when the 1967 armed conflict broke out. The Court accordingly finds that that Convention is applicable in the Palestinian territories which before the conflict lay to the east of the Green Line and which, during that conflict, were occupied by Israel, there being no need for any enquiry into the precise prior status of those territories. Of the other participants in the proceedings, those who addressed this issue contend that, on the contrary, both Covenants are applicable within the Occupied Palestinian Territory. On 3 October 1991 Israel ratified both the International Covenant on Economic, Social and Cultural Rights of 19 December 1966 and the International Covenant on Civil and Political Rights of the same date, as well as the United Nations Convention on the Rights of the Child of 20 November 1989. It is a party to these three instruments. In its Advisory Opinion of 8 July 1996 on the Legality of the Threat or Use of Nuclear Weapons, the Court had occasion to address the first of these issues in relation to the International Covenant on Civil and Political Rights. In those proceedings certain States had argued that “the Covenant was directed to the protection of human rights in peacetime, but that questions relating to unlawful loss of life in hostilities were governed by the law applicable in armed conflict” (I.C.J. Reports 1996 (I), p. 239, para. 24). More generally, the Court considers that the protection offered by human rights conventions does not cease in case of armed conflict, save through the effect of provisions for derogation of the kind to be found in Article 4 of the International Covenant on Civil and Political Rights. As regards the relationship between international humanitarian law and human rights law, there are thus three possible situations: some rights may be exclusively matters of international humanitarian law; others may be exclusively matters of human rights law; yet others may be matters of both these branches of international law. In order to answer the question put to it, the Court will have to take into consideration both these branches of international law, namely human rights law and, as lex specialis, international humanitarian law. It remains to be determined whether the two international Covenants and the Convention on the Rights of the Child are applicable only on the territories of the States parties thereto or whether they are also applicable outside those territories and, if so, in what circumstances. This provision can be interpreted as covering only individuals who are both present within a State’s territory and subject to that State’s jurisdiction. It can also be construed as covering both individuals present within a State’s territory and those outside that territory but subject to that State’s jurisdiction. The Court will thus seek to determine the meaning to be given to this text. The Court would observe that, while the jurisdiction of States is primarily territorial, it may sometimes be exercised outside the national territory. Considering the object and purpose of the International Covenant on Civil and Political Rights, it would seem natural that, even when such is the case, States parties to the Covenant should be bound to comply with its provisions. The constant practice of the Human Rights Committee is consistent with this. Thus, the Committee has found the Covenant applicable where the State exercises its jurisdiction on foreign territory. It has ruled on the legality of acts by Uruguay in cases of arrests carried out by Uruguayan agents in Brazil or Argentina (case No. 52/79, López Burgos v. Uruguay; case No. 56/79, Lilian Celiberti de Casariego v. Uruguay). It decided to the same effect in the case of the confiscation of a passport by a Uruguayan consulate in Germany (case No. 106/81, Montero v. Uruguay). The travaux préparatoires of the Covenant confirm the Committee’s interpretation of Article 2 of that instrument. These show that, in adopting the wording chosen, the drafters of the Covenant did not intend to allow States to escape from their obligations when they exercise jurisdiction outside their national territory. They only intended to prevent persons residing abroad from asserting, vis-à-vis their State of origin, rights that do not fall within the competence of that State, but of that of the State of residence (see the discussion of the preliminary draft in the Commission on Human Rights, E/CN.4/SR.194, para. 46; and United Nations, Official Records of the General Assembly, Tenth Session, Annexes, A/2929, Part II, Chap. V, para. 4 (1955)). The Court takes note in this connection of the position taken by Israel, in relation to the applicability of the Covenant, in its communications to the Human Rights Committee, and of the view of the Committee. In 1998, Israel stated that, when preparing its report to the Committee, it had had to face the question “whether individuals resident in the occupied territories were indeed subject to Israel’s jurisdiction” for purposes of the application of the Covenant (CCPR/C/SR.1675, para. 21). Israel took the position that “the Covenant and similar instruments did not apply directly to the current situation in the occupied territories” (ibid., para. 27). “in the current circumstances, the provisions of the Covenant apply to the benefit of the population of the Occupied Territories, for all conduct by the State party’s authorities or agents in those territories that affect the enjoyment of rights enshrined in the Covenant and fall within the ambit of State responsibility of Israel under the principles of public international law” (CCPR/CO/78/ISR, para. 11). In conclusion, the Court considers that the International Covenant on Civil and Political Rights is applicable in respect of acts done by a State in the exercise of its jurisdiction outside its own territory. The International Covenant on Economic, Social and Cultural Rights contains no provision on its scope of application. This may be explicable by the fact that this Covenant guarantees rights which are essentially territorial. However, it is not to be excluded that it applies both to territories over which a State party has sovereignty and to those over which that State exercises territorial jurisdiction. [...]. It is not without relevance to recall in this regard the position taken by Israel in its reports to the Committee on Economic, Social and Cultural Rights. In its initial report to the Committee of 4 December 1998, Israel provided “statistics indicating the enjoyment of the rights enshrined in the Covenant by Israeli settlers in the occupied Territories”. The Committee noted that, according to Israel, “the Palestinian population within the same jurisdictional areas were excluded from both the report and the protection of the Covenant” (E/C.12/1/Add. 27, para. 8). [...] its concern in this regard [...]. [...] In view of these observations, the Committee reiterated its concern about Israel’s position and reaffirmed “its view that the State party’s obligations under the Covenant apply to all territories and populations under its effective control” (E/C.12/1/Add.90, paras. 15 and 31). For the reasons explained in paragraph 106 above, the Court cannot accept Israel’s view. It would also observe that the territories occupied by Israel have for over 37 years been subject to its territorial jurisdiction as the occupying Power. In the exercise of the powers available to it on this basis, Israel is bound by the provisions of the International Covenant on Economic, Social and Cultural Rights. Furthermore, it is under an obligation not to raise any obstacle to the exercise of such rights in those fields where competence has been transferred to Palestinian authorities. As regards the Convention on the Rights of the Child of 20 November 1989, that instrument contains an Article 2 according to which “States Parties shall respect and ensure the rights set forth in the ...Convention to each child within their jurisdiction.. ” That Convention is therefore applicable within the Occupied Palestinian Territory. Having determined the rules and principles of international law relevant to reply to the question posed by the General Assembly, and having ruled in particular on the applicability within the Occupied Palestinian Territory of international humanitarian law and human rights law, the Court will now seek to ascertain whether the construction of the wall has violated those rules and principles. The Court notes that the route of the wall as fixed by the Israeli Government includes within the “Closed Area” (see paragraph 85 above) some 80 per cent of the settlers living in the Occupied Palestinian Territory. Moreover, it is apparent from an examination of the map mentioned in paragraph 80 above that the wall’s sinuous route has been traced in such a way as to include within that area the great majority of the Israeli settlements in the occupied Palestinian Territory (including East Jerusalem). As regards these settlements, the Court notes that Article 49, paragraph 6, of the Fourth Geneva Convention provides: “The Occupying Power shall not deport or transfer parts of its own civilian population into the territory it occupies.” That provision prohibits not only deportations or forced transfers of population such as those carried out during the Second World War, but also any measures taken by an occupying Power in order to organize or encourage transfers of parts of its own population into the occupied territory. In this respect, the information provided to the Court shows that, since 1977, Israel has conducted a policy and developed practices involving the establishment of settlements in the Occupied Palestinian Territory, contrary to the terms of Article 49, paragraph 6, just cited. “to rescind its previous measures and to desist from taking any action which would result in changing the legal status and geographical nature and materially affecting the demographic composition of the Arab territories occupied since 1967, including Jerusalem and, in particular, not to transfer parts of its own civilian population into the occupied Arab territories” (resolution 446 (1979) of 22 March 1979). The Council reaffirmed its position in resolutions 452 (1979) of 20 July 1979 and 465 (1980) of 1 March 1980. Indeed, in the latter case it described “Israel’s policy and practices of settling parts of its population and new immigrants in [the occupied] territories” as a “flagrant violation” of the Fourth Geneva Convention. The Court concludes that the Israeli settlements in the Occupied Palestinian Territory (including East Jerusalem) have been established in breach of international law. Whilst the Court notes the assurance given by Israel that the construction of the wall does not amount to annexation and that the wall is of a temporary nature (see paragraph 116 above), it nevertheless cannot remain indifferent to certain fears expressed to it that the route of the wall will prejudge the future frontier between Israel and Palestine, and the fear that Israel may integrate the settlements and their means of access. The Court considers that the construction of the wall and its associated régime create a “fait accompli” on the ground that could well become permanent, in which case, and notwithstanding the formal characterization of the wall by Israel, it would be tantamount to de facto annexation. [...] In other terms, the route chosen for the wall gives expression in loco to the illegal measures taken by Israel with regard to Jerusalem and the settlements, as deplored by the Security Council (see paragraphs 75 and 120 above). There is also a risk of further alterations to the demographic composition of the Occupied Palestinian Territory resulting from the construction of the wall inasmuch as it is contributing, as will be further explained in paragraph 133 below, to the departure of Palestinian populations from certain areas. That construction, along with measures taken previously, thus severely impedes the exercise by the Palestinian people of its right to self-determination, and is therefore a breach of Israel’s obligation to respect that right. The construction of the wall also raises a number of issues in relation to the relevant provisions of international humanitarian law and of human rights instruments. With regard to the Hague Regulations of 1907, the Court would recall that these deal, in Section II, with hostilities and in particular with “means of injuring the enemy, sieges, and bombardments”. Section III deals with military authority in occupied territories. Only Section III is currently applicable in the West Bank and Article 23 (g) of the Regulations, in Section II, is thus not pertinent. Section III of the Hague Regulations includes Articles 43, 46 and 52, which are applicable in the Occupied Palestinian Territory. Article 43 imposes a duty on the occupant to “take all measures within his power to restore, and, as far as possible, to insure public order and life, respecting the laws in force in the country”. Article 46 adds that private property must be “respected” and that it cannot “be confiscated”. Lastly, Article 52 authorizes, within certain limits, requisitions in kind and services for the needs of the army of occupation. Since the military operations leading to the occupation of the West Bank in 1967 ended a long time ago, only those Articles of the Fourth Geneva Convention referred to in Article 6, paragraph 3, remain applicable in that occupied territory. These provisions include Articles 47, 49, 52, 53 and 59 of the Fourth Geneva Convention. “Since its establishment, the State of Israel has been the victim of continuous threats and attacks on its very existence as well as on the life and property of its citizens. These have taken the form of threats of war, of actual armed attacks, and campaigns of terrorism resulting in the murder of and injury to human beings. The Government of Israel has therefore found it necessary, in accordance with the said article 4, to take measures to the extent strictly required by the exigencies of the situation, for the defence of the State and for the protection of life and property, including the exercise of powers of arrest and detention. The Court notes that the derogation so notified concerns only Article 9 of the International Covenant on Civil and Political Rights, which deals with the right to liberty and security of person and lays down the rules applicable in cases of arrest or detention. The other Articles of the Covenant therefore remain applicable not only on Israeli territory, but also on the Occupied Palestinian Territory. As regards the International Covenant on Economic, Social and Cultural Rights, that instrument includes a number of relevant provisions, namely: the right to work (Articles 6 and 7); protection and assistance accorded to the family and to children and young persons (Article 10); the right to an adequate standard of living, including adequate food, clothing and housing, and the right “to be free from hunger” (Art. 11); the right to health (Art. 12); the right to education (Arts. 13 and 14). Lastly, the United Nations Convention on the Rights of the Child of 20 November 1989 includes similar provisions in Articles 16, 24, 27 and 28. From the information submitted to the Court, particularly the report of the Secretary-General, it appears that the construction of the wall has led to the destruction or requisition of properties under conditions which contravene the requirements of Articles 46 and 52 of the Hague Regulations of 1907 and of Article 53 of the Fourth Geneva Convention. That construction, the establishment of a closed area between the Green Line and the wall itself and the creation of enclaves have moreover imposed substantial restrictions on the freedom of movement of the inhabitants of the Occupied Palestinian Territory (with the exception of Israeli citizens and those assimilated thereto). Such restrictions are most marked in urban areas, such as the Qalqiliya enclave or the City of Jerusalem and its suburbs. They are aggravated by the fact that the access gates are few in number in certain sectors and opening hours appear to be restricted and unpredictably applied. For example, according to the Special Rapporteur of the Commission on Human Rights on the situation of human rights in the Palestinian territories occupied by Israel since 1967, “Qalqiliya, a city with a population of 40,000, is completely surrounded by the Wall and residents can only enter and leave through a single military checkpoint open from 7 a.m. to 7 p.m.” (Report of the Special Rapporteur of the Commission on Human Rights, John Dugard, on the situation of human rights in the Palestinian territories occupied by Israel since 1967, submitted in accordance with Commission resolution 1993/2 A and entitled “Question of the Violation of Human Rights in the Occupied Arab Territories, including Palestine”, E/CN.4/2004/6, 8 September 2003, para. 9). There have also been serious repercussions for agricultural production, as is attested by a number of sources. According to the Special Committee to Investigate Israeli Practices Affecting the Human Rights of the Palestinian People and Other Arabs of the Occupied Territories “an estimated 100,000 dunums [approximately 10,000 hectares] of the West Bank’s most fertile agricultural land, confiscated by the Israeli Occupation Forces, have been destroyed during the first phase of the wall construction, which involves the disappearance of vast amounts of property, notably private agricultural land and olive trees, wells, citrus grows and hothouses upon which tens of thousands of Palestinians rely for their survival” (Report of the Special Committee to Investigate Israeli Practices Affecting the Human Rights of the Palestinian People and Other Arabs of the Occupied Territories, A/58/311, 22 August 2003, para. 26). Further, the Special Rapporteur on the situation of human rights in the Palestinian territories occupied by Israel since 1967 states that “Much of the Palestinian land on the Israeli side of the Wall consists of fertile agricultural land and some of the most important water wells in the region” and adds that “Many fruit and olive trees had been destroyed in the course of building the barrier.” (E/CN.4/2004/6, 8 September 2003, para. 9.) The Special Rapporteur on the Right to Food of the United Nations Commission on Human Rights states that construction of the wall “cuts off Palestinians from their agricultural lands, wells and means of subsistence” (Report by the Special Rapporteur of the United Nations Commission on Human Rights, Jean Ziegler, “The Right to Food”, Addendum, Mission to the Occupied Palestinian Territories, E/CN.4/2004/10/Add.2, 31 October 2003, para. 49). In a recent survey conducted by the World Food Programme, it is stated that the situation has aggravated food insecurity in the region, which reportedly numbers 25,000 new beneficiaries of food aid (report of the Secretary-General, para. 25). It has further led to increasing difficulties for the population concerned regarding access to health services, educational establishments and primary sources of water. This is also attested by a number of different information sources. Thus the report of the Secretary-General states generally that “According to the Palestinian Central Bureau of Statistics, so far the Barrier has separated 30 localities from health services, 22 from schools, 8 from primary water sources and 3 from electricity networks.” (Report of the Secretary-General, para. 23.) The Special Rapporteur of the United Nations Commission on Human Rights on the situation of human rights in the Palestinian territories occupied by Israel since 1967 states that “Palestinians between the Wall and Green Line will effectively be cut off from their land and workplaces, schools, health clinics and other social services.” (E/CN.4/2004/6, 8 September 2003, para. 9.) In relation specifically to water resources, the Special Rapporteur on the Right to Food of the United Nations Commission on Human Rights observes that “By constructing the fence Israel will also effectively annex most of the western aquifer system (which provides 51 per cent of the West Bank’s water resources).” (E/CN.4/2004/10/Add.2, 31 October 2003, para. 51.) Similarly, in regard to access to health services, it has been stated that, as a result of the enclosure of Qalqiliya, a United Nations hospital in that town has recorded a 40 per cent decrease in its caseload (report of the Secretary-General, para. 24). At Qalqiliya, according to reports furnished to the United Nations, some 600 shops or businesses have shut down, and 6,000 to 8,000 people have already left the region (E/CN.4/2004/6, 8 September 2003, para. 10; E/CN.4/2004/10/Add.2, 31 October 2003, para. 51). The Special Rapporteur on the Right to Food of the United Nations Commission on Human Rights has also observed that “With the fence/wall cutting communities off from their land and water without other means of subsistence, many of the Palestinians living in these areas will be forced to leave.” (E/CN.4/2004/10/Add.2, 31 October 2003, para. 51.) In this respect also the construction of the wall would effectively deprive a significant number of Palestinians of the “freedom to choose [their] residence”. In addition, however, in the view of the Court, since a significant number of Palestinians have already been compelled by the construction of the wall and its associated régime to depart from certain areas, a process that will continue as more of the wall is built, that construction, coupled with the establishment of the Israeli settlements mentioned in paragraph 120 above, is tending to alter the demographic composition of the Occupied Palestinian Territory. To sum up, the Court is of the opinion that the construction of the wall and its associated régime impede the liberty of movement of the inhabitants of the Occupied Palestinian Territory (with the exception of Israeli citizens and those assimilated thereto) as guaranteed under Article 12, paragraph 1, of the International Covenant on Civil and Political Rights. They also impede the exercise by the persons concerned of the right to work, to health, to education and to an adequate standard of living as proclaimed in the International Covenant on Economic, Social and Cultural Rights and in the United Nations Convention on the Rights of the Child. Lastly, the construction of the wall and its associated régime, by contributing to the demographic changes referred to in paragraphs 122 and 133 above, contravene Article 49, paragraph 6, of the Fourth Geneva Convention and the Security Council resolutions cited in paragraph 120 above. The Court would observe, however, that the applicable international humanitarian law contains provisions enabling account to be taken of military exigencies in certain circumstances. Neither Article 46 of the Hague Regulations of 1907 nor Article 47 of the Fourth Geneva Convention contain any qualifying provision of this type. With regard to forcible transfers of population and deportations, which are prohibited under Article 49, paragraph 1, of the Convention, paragraph 2 of that Article provides for an exception in those cases in which “the security of the population or imperative military reasons so demand”. This exception however does not apply to paragraph 6 of that Article, which prohibits the occupying Power from deporting or transferring parts of its own civilian population into the territories it occupies. As to Article 53 concerning the destruction of personal property, it provides for an exception “where such destruction is rendered absolutely necessary by military operations”. The Court considers that the military exigencies contemplated by these texts may be invoked in occupied territories even after the general close of the military operations that led to their occupation. However, on the material before it, the Court is not convinced that the destructions carried out contrary to the prohibition in Article 53 of the Fourth Geneva Convention were rendered absolutely necessary by military operations. The Court would further observe that some human rights conventions, and in particular the International Covenant on Civil and Political Rights, contain provisions which States parties may invoke in order to derogate, under various conditions, from certain of their conventional obligations. In this respect, the Court would however recall that the communication notified by Israel to the Secretary-General of the United Nations under Article 4 of the International Covenant on Civil and Political Rights concerns only Article 9 of the Covenant, relating to the right to freedom and security of person (see paragraph 127 above); Israel is accordingly bound to respect all the other provisions of that instrument. The Court would observe that the restrictions provided for under Article 12, paragraph 3, of the International Covenant on Civil and Political Rights are, by the very terms of that provision, exceptions to the right of freedom of movement contained in paragraph 1. In addition, it is not sufficient that such restrictions be directed to the ends authorized; they must also be necessary for the attainment of those ends. As the Human Rights Committee put it, they “must conform to the principle of proportionality” and “must be the least intrusive instrument amongst those which might achieve the desired result” (CCPR/C/21/Rev.1/Add.9, General Comment No. 27, para. 14). On the basis of the information available to it, the Court finds that these conditions are not met in the present instance. The Court would further observe that the restrictions on the enjoyment by the Palestinians living in the territory occupied by Israel of their economic, social and cultural rights, resulting from Israel’s construction of the wall, fail to meet a condition laid down by Article 4 of the International Covenant on Economic, Social and Cultural Rights, that is to say that their implementation must be “solely for the purpose of promoting the general welfare in a democratic society”. To sum up, the Court, from the material available to it, is not convinced that the specific course Israel has chosen for the wall was necessary to attain its security objectives. The wall, along the route chosen, and its associated régime gravely infringe a number of rights of Palestinians residing in the territory occupied by Israel, and the infringements resulting from that route cannot be justified by military exigencies or by the requirements of national security or public order. The construction of such a wall accordingly constitutes breaches by Israel of various of its obligations under the applicable international humanitarian law and human rights instruments. The Court has thus concluded that the construction of the wall constitutes action not in conformity with various international legal obligations incumbent upon Israel. However, Annex I to the report of the Secretary-General states that, according to Israel: “the construction of the Barrier is consistent with Article 51 of the Charter of the United Nations, its inherent right to self-defence and Security Council resolutions 1368 (2001) and 1373 (2001)”. More specifically, Israel’s Permanent Representative to the United Nations asserted in the General Assembly on 20 October 2003 that “the fence is a measure wholly consistent with the right of States to self-defence enshrined in Article 51 of the Charter”; the Security Council resolutions referred to, he continued, “have clearly recognized the right of States to use force in self-defence against terrorist attacks”, and therefore surely recognize the right to use non-forcible measures to that end (A/ES-10/PV.21, p. 6). Article 51 of the Charter thus recognizes the existence of an inherent right of self-defence in the case of armed attack by one State against another State. However, Israel does not claim that the attacks against it are imputable to a foreign State. The Court also notes that Israel exercises control in the Occupied Palestinian Territory and that, as Israel itself states, the threat which it regards as justifying the construction of the wall originates within, and not outside, that territory. The situation is thus different from that contemplated by Security Council resolutions 1368 (2001) and 1373 (2001), and therefore Israel could not in any event invoke those resolutions in support of its claim to be exercising a right of self-defence. Consequently, the Court concludes that Article 51 of the Charter has no relevance in this case. The Court has, however, considered whether Israel could rely on a state of necessity which would preclude the wrongfulness of the construction of the wall. In this regard the Court is bound to note that some of the conventions at issue in the present instance include qualifying clauses of the rights guaranteed or provisions for derogation (see paragraphs 135 and 136 above). Since those treaties already address considerations of this kind within their own provisions, it might be asked whether a state of necessity as recognized in customary international law could be invoked with regard to those treaties as a ground for precluding the wrongfulness of the measures or decisions being challenged. However, the Court will not need to consider that question. As the Court observed in the case concerning the Gabcíkovo-Nagymaros Project (Hungary/Slovakia), “the state of necessity is a ground recognized by customary international law” that “can only be accepted on an exceptional basis”; it “can only be invoked under certain strictly defined conditions which must be cumulatively satisfied; and the State concerned is not the sole judge of whether those conditions have been met” (I.C.J. Reports 1997, p. 40, para. 51). One of those conditions was stated by the Court in terms used by the International Law Commission, in a text which in its present form requires that the act being challenged be “the only way for the State to safeguard an essential interest against a grave and imminent peril” (Article 25 of the International Law Commission’s Articles on Responsibility of States for Internationally Wrongful Acts; [...]). In the light of the material before it, the Court is not convinced that the construction of the wall along the route chosen was the only means to safeguard the interests of Israel against the peril which it has invoked as justification for that construction. The fact remains that Israel has to face numerous indiscriminate and deadly acts of violence against its civilian population. It has the right, and indeed the duty, to respond in order to protect the life of its citizens. The measures taken are bound nonetheless to remain in conformity with applicable international law. In conclusion, the Court considers that Israel cannot rely on a right of self-defence or on a state of necessity in order to preclude the wrongfulness of the construction of the wall resulting from the considerations mentioned in paragraphs 122 and 137 above. The Court accordingly finds that the construction of the wall, and its associated régime, are contrary to international law. Since the Court has concluded that the construction of the wall in the Occupied Palestinian Territory, including in and around East Jerusalem, and its associated régime, are contrary to various of Israel’s international obligations, it follows that the responsibility of that State is engaged under international law. The Court will now examine the legal consequences resulting from the violations of international law by Israel by distinguishing between, on the one hand, those arising for Israel and, on the other, those arising for other States and, where appropriate, for the United Nations. The Court will begin by examining the legal consequences of those violations for Israel. The Court notes that Israel is first obliged to comply with the international obligations it has breached by the construction of the wall in the Occupied Palestinian Territory (see paragraphs 114-137 above). Consequently, Israel is bound to comply with its obligation to respect the right of the Palestinian people to self-determination and its obligations under international humanitarian law and international human rights law. Furthermore, it must ensure freedom of access to the Holy Places that came under its control following the 1967 War (see paragraph 129 above). Israel accordingly has the obligation to cease forthwith the works of construction of the wall being built by it in the Occupied Palestinian Territory, including in and around East Jerusalem. Moreover, in view of the Court’s finding (see paragraph 143 above) that Israel’s violations of its international obligations stem from the construction of the wall and from its associated régime, cessation of those violations entails the dismantling forthwith of those parts of that structure situated within the Occupied Palestinian Territory, including in and around East Jerusalem. All legislative and regulatory acts adopted with a view to its construction, and to the establishment of its associated régime, must forthwith be repealed or rendered ineffective, except in so far as such acts, by providing for compensation or other forms of reparation for the Palestinian population, may continue to be relevant for compliance by Israel with the obligations referred to in paragraph 153 below. Israel is accordingly under an obligation to return the land, orchards, olive groves and other immovable property seized from any natural or legal person for purposes of construction of the wall in the Occupied Palestinian Territory. In the event that such restitution should prove to be materially impossible, Israel has an obligation to compensate the persons in question for the damage suffered. The Court considers that Israel also has an obligation to compensate, in accordance with the applicable rules of international law, all natural or legal persons having suffered any form of material damage as a result of the wall’s construction. The Court will now consider the legal consequences of the internationally wrongful acts flowing from Israel’s construction of the wall as regards other States. The Court would observe that the obligations violated by Israel include certain obligations erga omnes. As the Court indicated in the Barcelona Traction case, such obligations are by their very nature “the concern of all States” and, “In view of the importance of the rights involved, all States can be held to have a legal interest in their protection.” (Barcelona Traction, Light and Power Company, Limited, Second Phase, Judgment, I.C.J. Reports 1970, p. 32, para. 33.) The obligations erga omnes violated by Israel are the obligation to respect the right of the Palestinian people to self-determination, and certain of its obligations under international humanitarian law. With regard to international humanitarian law, the Court recalls that in its Advisory Opinion on the Legality of the Threat or Use of Nuclear Weapons, it stated that “a great many rules of humanitarian law applicable in armed conflict are so fundamental to the respect of the human person and ‘elementary considerations of humanity’...”, that they are “to be observed by all States whether or not they have ratified the conventions that contain them, because they constitute intransgressible principles of international customary law” (I.C.J. Reports 1996 (I), p. 257, para. 79). In the Court’s view, these rules incorporate obligations which are essentially of an erga omnes character. The Court would also emphasize that Article 1 of the Fourth Geneva Convention [...] provides that “The High Contracting Parties undertake to respect and to ensure respect for the present Convention in all circumstances.” It follows from that provision that every State party to that Convention, whether or not it is a party to a specific conflict, is under an obligation to ensure that the requirements of the instruments in question are complied with. Given the character and the importance of the rights and obligations involved, the Court is of the view that all States are under an obligation not to recognize the illegal situation resulting from the construction of the wall in the Occupied Palestinian Territory, including in and around East Jerusalem. They are also under an obligation not to render aid or assistance in maintaining the situation created by such construction. It is also for all States, while respecting the United Nations Charter and international law, to see to it that any impediment, resulting from the construction of the wall, to the exercise by the Palestinian people of its right to self-determination is brought to an end. In addition, all the States parties to the Geneva Convention [...] are under an obligation, while respecting the United Nations Charter and international law, to ensure compliance by Israel with international humanitarian law as embodied in that Convention. Finally, the Court is of the view that the United Nations, and especially the General Assembly and the Security Council, should consider what further action is required to bring to an end the illegal situation resulting from the construction of the wall and the associated régime, taking due account of the present Advisory Opinion. The United Nations, and especially the General Assembly and the Security Council, should consider what further action is required to bring to an end the illegal situation resulting from the construction of the wall and the associated régime, taking due account of the present Advisory Opinion. I have voted in favour of all paragraphs of the operative part of the Advisory Opinion with one exception, viz. subparagraph (3) (D) dealing with the legal consequences for States. I had a number of reasons for casting that negative vote which I will only briefly indicate at this stage, since I will come back to them when commenting on the various parts of the Opinion. And, third, I find the Court’s conclusions as laid down in subparagraph (3) (D) of the dispositif rather weak; apart from the Court’s finding that States are under an obligation “not to render aid or assistance in maintaining the situation created by [the] construction [of the wall]” (a finding I subscribe to) I find it difficult to envisage what States are expected to do or not to do in actual practice. In my opinion a judicial body’s findings should have a direct bearing on the addressee’s behaviour; neither the first nor the last part of operative subparagraph (3) (D) meets this requirement. [...] If it is correct that the Government of Israel claims that the Fourth Geneva Convention is not applicable de jure in the West Bank since that territory had not previously to the 1967 war been under Jordanian sovereignty, that argument already fails since a territory, which by one of the parties to an armed conflict is claimed as its own and is under its control, is – once occupied by the other party – by definition occupied territory of a High Contracting Party in the sense of the Fourth Geneva Convention (emphasis added). And both Israel and Jordan were parties to the Convention. Proportionality – The Court finds that the conditions set out in the qualifying clauses in the applicable humanitarian law and human rights conventions have not been met and that the measures taken by Israel cannot be justified by military exigencies or by requirements of national security or public order (paras. 135-137). I agree with that finding but in my opinion the construction of the wall should also have been put to the proportionality test, in particular since the concepts of military necessity and proportionality have always been intimately linked in international humanitarian law. And in my view it is of decisive importance that, even if the construction of the wall and its associated régime could be justified as measures necessary to protect the legitimate rights of Israeli citizens, these measures would not pass the proportionality test. The route chosen for the construction of the wall and the ensuing disturbing consequences for the inhabitants of the Occupied Palestinian Territory are manifestly disproportionate to interests which Israel seeks to protect, as seems to be recognized also in recent decisions of the Israeli Supreme Court. Self-defence – Israel based the construction of the wall on its inherent right of self-defence as contained in Article 51 of the Charter. In this respect it relied on Security Council resolutions 1368 (2001) and 1373 (2001), adopted after the terrorist attacks of 11 September 2001 against targets located in the United States. The Court starts its response to this argument by stating that Article 51 recognizes the existence of an inherent right of self-defence in the case of an armed attack by one State against another State (para. 139). Although this statement is undoubtedly correct, as a reply to Israel’s argument it is, with all due respect, beside the point. Resolutions 1368 and 1373 recognize the inherent right of individual or collective self-defence without making any reference to an armed attack by a State. The Security Council called acts of international terrorism, without any further qualification, a threat to international peace and security which authorizes it to act under Chapter VII of the Charter. And it actually did so in resolution 1373 without ascribing these acts of terrorism to a particular State. This is the completely new element in these resolutions. This new element is not excluded by the terms of Article 51 since this conditions the exercise of the inherent right of self-defence on a previous armed attack without saying that this armed attack must come from another State even if this has been the generally accepted interpretation for more than 50 years. The Court has regrettably by-passed this new element, the legal implications of which cannot as yet be assessed but which marks undeniably a new approach to the concept of self-defence. The argument which in my view is decisive for the dismissal of Israel’s claim that it is merely exercising its right of self-defence can be found in the second part of paragraph 139. The right of self-defence as contained in the Charter is a rule of international law and thus relates to international phenomena. Resolutions 1368 and 1373 refer to acts of international terrorism as constituting a threat to international peace and security; they therefore have no immediate bearing on terrorist acts originating within a territory which is under control of the State which is also the victim of these acts. And Israel does not claim that these acts have their origin elsewhere. The Court therefore rightly concludes that the situation is different from that contemplated by resolutions 1368 and 1373 and that consequently Article 51 of the Charter cannot be invoked by Israel. Paragraph 1 of Article 41 explicitly refers to a duty to co-operate. As paragraph 3 of the commentary states “What is called for in the face of serious breaches is a joint and co-ordinated effort by all States to counteract the effects of these breaches.” And paragraph 2 refers to “co-operation ... in the framework of a competent international organization, in particular the United Nations”. Article 41, paragraph 1, therefore does not refer to individual obligations of third States as a result of a serious breach. What is said there is encompassed in the Court’s finding in operative sub-paragraph (3) (E) and not in subparagraph (3) (D). Article 41, paragraph 2, however, explicitly mentions the duty not to recognize as lawful a situation created by a serious breach just as operative subparagraph (3) (D) does. In its commentary the ILC refers to unlawful situations which – virtually without exception – take the form of a legal claim, usually to territory. It gives as examples “an attempted acquisition of sovereignty over territory through denial of the right of self-determination”, the annexation of Manchuria by Japan and of Kuwait by Iraq, South-Africa’s claim to Namibia, the Unilateral Declaration of Independence in Rhodesia and the creation of Bantustans in South Africa. In other words, all examples mentioned refer to situations arising from formal or quasi-formal promulgations intended to have an erga omnes effect. I have no problem with accepting a duty of non-recognition in such cases. I have great difficulty, however, in understanding what the duty not to recognize an illegal fact involves. What are the individual addressees of this part of operative subparagraph (3) (D) supposed to do in order to comply with this obligation? That question is even more cogent considering that 144 States unequivocally have condemned the construction of the wall as unlawful (res. ES-10/13), whereas those States which abstained or voted against (with the exception of Israel) did not do so because they considered the construction of the wall as legal. The duty not to recognize amounts, therefore, in my view to an obligation without real substance. That argument does not apply to the second obligation mentioned in Article 41, paragraph 2, namely the obligation not to render aid or assistance in maintaining the situation created by the serious breach. I therefore fully support that part of operative subparagraph (3) (D). Moreover, I would have been in favour of adding in the reasoning or even in the operative part a sentence reminding States of the importance of rendering humanitarian assistance to the victims of the construction of the wall. (The Court included a similar sentence, be it with a different scope, in its Opinion in the Namibia case, I.C.J. Reports 1971, p. 56, para. 125). Finally, I have difficulty in accepting the Court’s finding that the States parties to the Fourth Geneva Convention are under an obligation to ensure compliance by Israel with humanitarian law as embodied in that Convention (para. 159, operative subparagraph (3) (D), last part). Now it is true that already from an early moment the ICRC in its (non-authoritative) commentaries on the 1949 Convention has taken the position that common Article 1 contains an obligation for all States parties to ensure respect by other States parties. It is equally true that the Diplomatic Conference which adopted the 1977 Additional Protocols incorporated common Article 1 in the First Protocol. But at no moment did the Conference deal with its presumed implications for third States. Hardly less helpful is the Court’s reference to common Article 1 in the Nicaragua case. The Court, without interpreting its terms, observed that “such an obligation does not derive only from the Conventions themselves, but from the general principles of humanitarian law to which the Conventions merely give specific expression”. The Court continued that “The United States [was] thus under an obligation not to encourage persons or groups engaged in the conflict in Nicaragua” to act in violation of common Article 3 (Military and Paramilitary Activities in and against Nicaragua (Nicaragua v. United States of America), Judgment, I.C.J. Reports 1986, p. 114, para. 220). But this duty of abstention is completely different from a positive duty to ensure compliance with the law. Although I certainly am not in favour of a restricted interpretation of common Article 1, such as may have been envisaged in 1949, I simply do not know whether the scope given by the Court to this Article in the present Opinion is correct as a statement of positive law. Since the Court does not give any argument in its reasoning, I do not feel able to support its finding. Moreover, I fail to see what kind of positive action, resulting from this obligation, may be expected from individual States, apart from diplomatic demarches. 3.1. [...] The Israeli occupation has lasted for almost four decades. Occupation, regardless of its duration, gives rise to a myriad of human, legal and political problems. In dealing with prolonged belligerent occupation, international law seeks to “perform a holding operation pending the termination of the conflict”. No one underestimates the inherent difficulties that arise during situations of prolonged occupation. A prolonged occupation strains and stretches the applicable rules, however, the law of belligerent occupation must be fully respected regardless of the duration of the occupation. I wholeheartedly subscribe to the view [...] that the breaches by both sides of the fundamental rules of humanitarian law reside in “the illegality of the Israeli occupation regime itself”. Occupation, as an illegal and temporary situation, is at the heart of the whole problem. The only viable prescription to end the grave violations of international humanitarian law is to end occupation. 3.2. [...] Military necessities and military exigencies could arguably be advanced as justification for building the wall had Israel proven that it could perceive no other alternative for safeguarding its security. This, as the Court notes, Israel failed to demonstrate. A distinction must be drawn between building the wall as a security measure, as Israel contends, and accepting that the principle of military necessity could be invoked to justify the unwarranted destruction and demolition that accompanied the construction process. Military necessity, if applicable, extends to the former and not the latter. The magnitude of the damage and injury inflicted upon the civilian inhabitants in the course of building the wall and its associated régime is clearly prohibited under international humanitarian law. The destruction of homes, the demolition of the infrastructure, and the despoilment of land, orchards and olive groves that has accompanied the construction of the wall cannot be justified under any pretext whatsoever. Over 100,000 civilian non-combatants have been rendered homeless and hapless. [...] So far as the request of the Assembly envisages an opinion on humanitarian law, however, the obligations thereby imposed are (save for their own qualifying provisions) absolute. That is the bedrock of humanitarian law, and those engaged in conflict have always known that it is the price of our hopes for the future that they must, whatever the provocation, fight “with one hand behind their back” and act in accordance with international law. While that factor diminishes relevance of context so far as the obligations of humanitarian law are concerned, it remains true, nonetheless, that context is important for other aspects of international law that the Court chooses to address. Yet the formulation of the question precludes consideration of that context. I think the Court should also have taken the opportunity to say, in the clearest terms, what regrettably today apparently needs constant reaffirmation even among international lawyers, namely, that the protection of civilians remains an intransgressible obligation of humanitarian law, not only for the occupier but equally for those seeking to liberate themselves from occupation. The General Assembly has in resolution ES-10/13 determined that the wall contravenes humanitarian law, without specifying which provisions and why. Palestine has informed the Court that it regards Articles 33, 53, 55 and 64 of the Fourth Geneva Convention and Article 52 of the Hague Regulations as violated. Other participants invoked Articles 23 (g), 46, 50 and 52 of the Hague Regulations, and Articles 27, 47, 50, 55, 56 and 59 of the Fourth Convention. For the Special Rapporteur, the wall constitutes a violation of Articles 23 (g) and 46 of the Hague Regulations and Articles 47, 49, 50, 53 and 55 of the Fourth Geneva Convention. It might have been expected that an advisory opinion would have contained a detailed analysis, by reference to the texts, the voluminous academic literature and the facts at the Court’s disposal, as to which of these propositions is correct. Such an approach would have followed the tradition of using advisory opinions as an opportunity to elaborate and develop international law. It would also, as a matter of balance, have shown not only which provisions Israel has violated, but also which it has not. But the Court, once it has decided which of these provisions are in fact applicable, thereafter refers only to those which Israel has violated. Further, the structure of the Opinion, in which humanitarian law and human rights law are not dealt with separately, makes it in my view extremely difficult to see what exactly has been decided by the Court. Notwithstanding the very general language of subparagraph (3) (A) of the dispositif, it should not escape attention that the Court has in the event found violations only of Article 49 of the Fourth Geneva Convention (para. 120), and of Articles 46 and 52 of the Hague Regulations and Article 53 of the Fourth Geneva Convention (para. 132). I agree with these findings. After its somewhat light treatment of international humanitarian law, the Court turns to human rights law. I agree with the Court’s finding about the continued relevance of human rights law in the occupied territories. I also concur in the findings made at paragraph 134 as regards Article 12 of the International Covenant on Civil and Political Rights. At the same time, it has to be noted that there are established treaty bodies whose function it is to examine in detail the conduct of States parties to each of the Covenants. Indeed, the Court’s response as regards the International Covenant on Civil and Political Rights notes both the pertinent jurisprudence of the Human Rights Committee and also the concluding observations of the Committee on Israel’s duties in the occupied territories. So far as the International Covenant on Economic, Social and Cultural Rights is concerned, the situation is even stranger, given the programmatic requirements for the fulfilment of this category of rights. The Court has been able to do no more than observe, in a single phrase, that the wall and its associated régime “impede the exercise by the persons concerned of the right to work, to health, to education and to an adequate standard of living as proclaimed in the International Covenant on Economic, Social and Cultural Rights . . .” (para. 134). For both Covenants, one may wonder about the appropriateness of asking for advisory opinions from the Court on compliance by States parties with such obligations, which are monitored, in much greater detail, by a treaty body established for that purpose. It could hardly be an answer that the General Assembly is not setting any more general precedent, because while many, many States are not in compliance with their obligations under the two Covenants, the Court is being asked to look only at the conduct of Israel in this regard. I do not agree with all that the Court has to say on the question of the law of self-defence. In paragraph 139 the Court quotes Article 51 of the Charter and then continues “Article 51 of the Charter thus recognizes the existence of an inherent right of self-defence in the case of armed attack by one State against another State.” There is, with respect, nothing in the text of Article 51 that thus stipulates that self-defence is available only when an armed attack is made by a State. That qualification is rather a result of the Court so determining in Military and Paramilitary Activities in and against Nicaragua (Nicaragua v. United States of America) (Merits, Judgment, I.C.J. Reports 1986, p. 14). It there held that military action by irregulars could constitute an armed attack if these were sent by or on behalf of the State and if the activity “because of its scale and effects, would have been classified as an armed attack . . . had it been carried out by regular armed forces” (ibid., p. 103, para. 195). While accepting, as I must, that this is to be regarded as a statement of the law as it now stands, I maintain all the reservations as to this proposition that I have expressed elsewhere (R. Higgins, Problems and Process: International Law and How We Use It, pp. 250-251). I also find unpersuasive the Court’s contention that, as the uses of force emanate from occupied territory, it is not an armed attack “by one State against another”. I fail to understand the Court’s view that an occupying Power loses the right to defend its own civilian citizens at home if the attacks emanate from the occupied territory – a territory which it has found not to have been annexed and is certainly “other than” Israel. Further, Palestine cannot be sufficiently an international entity to be invited to these proceedings, and to benefit from humanitarian law, but not sufficiently an international entity for the prohibition of armed attack on others to be applicable. This is formalism of an unevenhanded sort. The question is surely where responsibility lies for the sending of groups and persons who act against Israeli civilians and the cumulative severity of such action. In the event, however, these reservations have not caused me to vote against subparagraph (3) (A) of the dispositif, for two reasons. First, I remain unconvinced that non-forcible measures (such as the building of a wall) fall within self-defence under Article 51 of the Charter as that provision is normally understood. Second, even if it were an act of self-defence, properly so called, it would need to be justified as necessary and proportionate. While the wall does seem to have resulted in a diminution of attacks on Israeli civilians, the necessity and proportionality for the particular route selected, with its attendant hardships for Palestinians uninvolved in these attacks, has not been explained. I have voted in favour of subparagraph (3) (D) of the dispositif but, unlike the Court, I do not think that the specified consequence of the identified violations of international law have anything to do with the concept of erga omnes (cf. paras. 154-159 of this Opinion). The Court’s celebrated dictum in Barcelona Traction, Light and Power Company, Limited, Second Phase, (Judgment, I.C.J. Reports 1970, p. 32, para. 33) is frequently invoked for more than it can bear. Regrettably, this is now done also in this Opinion, at paragraph 155. That dictum was directed to a very specific issue of jurisdictional locus standi. As the International Law Commission has correctly put it in the Commentaries to the draft Articles on the Responsibility of States for Internationally Wrongful Acts (A/56/10 at p. 278), there are certain rights in which, by reason of their importance “all states have a legal interest in their protection”. It has nothing to do with imposing substantive obligations on third parties to a case. It will be noted that the Court has, in subparagraph (3) (D) of the dispositif, carefully indicated that any such action should be in conformity with the Charter and international law. It may well be, and I am prepared to assume it, that on a thorough analysis of all relevant facts, a finding could well be made that some or even all segments of the wall being constructed by Israel on the Occupied Palestinian Territory violate international law (see para. 10 below). But to reach that conclusion with regard to the wall as a whole without having before it or seeking to ascertain all relevant facts bearing directly on issues of Israel’s legitimate right of self-defence, military necessity and security needs, given the repeated deadly terrorist attacks in and upon Israel proper coming from the Occupied Palestinian Territory to which Israel has been and continues to be subjected, cannot be justified as a matter of law. The nature of these cross-Green Line attacks and their impact on Israel and its population are never really seriously examined by the Court, and the dossier provided the Court by the United Nations on which the Court to a large extent bases its findings barely touches on that subject. I am not suggesting that such an examination would relieve Israel of the charge that the wall it is building violates international law, either in whole or in part, only that without this examination the findings made are not legally well founded. In my view, the humanitarian needs of the Palestinian people would have been better served had the Court taken these considerations into account, for that would have given the Opinion the credibility I believe it lacks. [...] [A]ll we have from the Court is a description of the harm the wall is causing and a discussion of various provisions of international humanitarian law and human rights instruments followed by the conclusion that this law has been violated. Lacking is an examination of the facts that might show why the alleged defences of military exigencies, national security or public order are not applicable to the wall as a whole or to the individual segments of its route. The Court says that it “is not convinced” but it fails to demonstrate why it is not convinced, and that is why these conclusions are not convincing. It is true that some international humanitarian law provisions the Court cites admit of no exceptions based on military exigencies. Thus, Article 46 of the Hague Rules provides that private property must be respected and may not be confiscated. In the Summary of the legal position of the Government of Israel, Annex I to the report of the United Nations Secretary-General, A/ES-10/248, p. 8, the Secretary-General reports Israel’s position on this subject in part as follows: “The Government of Israel argues: there is no change in ownership of the land; compensation is available for use of land, crop yield or damage to the land; residents can petition the Supreme Court to halt or alter construction and there is no change in resident status.” The Court fails to address these arguments. While these Israeli submissions are not necessarily determinative of the matter, they should have been dealt with by the Court and related to Israel’s further claim that the wall is a temporary structure, which the Court takes note of as an “assurance given by Israel” (para. 121). Paragraph 6 of Article 49 of the Fourth Geneva Convention also does not admit for exceptions on grounds of military or security exigencies. It provides that “the Occupying Power shall not deport or transfer parts of its own civilian population into the territory it occupies”. I agree that this provision applies to the Israeli settlements in the West Bank and that their existence violates Article 49, paragraph 6. It follows that the segments of the wall being built by Israel to protect the settlements are ipso facto in violation of international humanitarian law. Moreover, given the demonstrable great hardship to which the affected Palestinian population is being subjected in and around the enclaves created by those segments of the wall, I seriously doubt that the wall would here satisfy the proportionality requirement to qualify as a legitimate measure of self-defence. The Commander of the IDF Forces in Judea and Samaria issued orders to take possession of plots of land in the area of Judea and Samaria. The purpose of the seizure was to erect a separation fence on the land. The question before us is whether the orders and the fence are legal. Since 1967, Israel has been holding the areas of Judea and Samaria [hereinafter – the area] in belligerent occupation. In 1993 Israel began a political process with the PLO, and signed a number of agreements transferring control over parts of the area to the Palestinian Authority. Israel and the PLO continued political negotiations in an attempt to solve the remaining problems. The negotiations, whose final stages took place at Camp David in Maryland, USA, failed in July 2000. From respondents’ affidavit in answer to order nisi we learned that, a short time after the failure of the Camp David talks, the Israeli-Palestinian conflict reached new heights of violence. In September 2000, the Palestinian side began a campaign of terror against Israel and Israelis. Terror attacks take place both in the area and in Israel. They are directed against citizens and soldiers, men and women, elderly and infants, regular citizens and public figures. Terror attacks are carried out everywhere [...]. Terror organizations use gunfire attacks, suicide attacks, mortar fire, Katyusha rocket fire, and car bombs. From September 2000 until the beginning of April 2004, more than 780 attacks were carried out within Israel. During the same period, more than 8200 attacks were carried out in the area. The armed conflict claimed (as of April 2004) the lives of 900 Israeli citizens and residents. More than 6000 were injured, some with serious wounds that have left them severely handicapped. The armed conflict has left many dead and wounded on the Palestinian side as well. Bereavement and pain wash over us. Parts of the separation fence are being erected on land which is not privately owned. Other parts are being erected on private land. In such circumstances – and in light of the security necessities – an order of seizure is issued by the Commander of the IDF Forces in the area of Judea and Samaria (respondent 2). Pursuant to standard procedure, every land owner whose land is seized will receive compensation for the use of his land. After the order of seizure is signed, it is brought to the attention of the public, and the proper liaison body of the Palestinian Authority is contacted. An announcement is relayed to the residents, and each interested party is invited to participate in a survey of the area affected by the order of seizure, in order to present the planned location of the fence. A few days after the order is issued, a survey is taken of the area, with the participation of the landowners, in order to point out the land which is about to be seized. After the survey, a one week leave is granted to the landowners, so that they may submit an appeal to the military commander. The substance of the appeals is examined. Where it is possible, an attempt is made to reach understandings with the landowners. If the appeal is denied, leave of one additional week is given to the landowner, so that he may petition the High Court of Justice. The petition, as originally worded, attacked the orders of seizure regarding lands in the villages of Beit Sourik, Bidu, El Kabiba, Katane, Beit A’anan, Beit Likia, Beit Ajaza and Beit Daku. [...] Petitioners are the landowners and the village councils affected by the orders of seizure. They argue that the orders of seizure are illegal. As such, they should be voided or the location of the separation fence should be changed. The injury to petitioners, they argue, is severe and unbearable. Over 42,000 dunams of their lands are affected. The obstacle itself passes over 4,850 dunams, and will separate between petitioners and more than 37,000 dunams, 26,500 of which are agricultural lands that have been cultivated for many generations. Access to these agricultural lands will become difficult and even impossible. Petitioners’ ability to go from place to place will depend on a bureaucratic permit regime which is labyrinthine, complex, and burdensome. Use of local water wells will not be possible. As such, access to water for crops will be hindered. Shepherding, which depends on access to these wells, will be made difficult. Tens of thousands of olive and fruit trees will be uprooted. The fence will separate villages from tens of thousands of additional trees. The livelihood of many hundreds of Palestinian families, based on agriculture, will be critically injured. Moreover, the separation fence injures not only landowners to whom the orders of seizure apply; the lives of 35,000 village residents will be disrupted. The separation fence will harm the villages’ ability to develop and expand. The access roads to the urban centers of Ramallah and Bir Naballa will be blocked off. Access to medical and other services in East Jerusalem and in other places will become impossible. Ambulances will encounter difficulty in providing emergency services to residents. Children’s access to schools in the urban centers, and of students to universities, will be impaired. Petitioners argue that these injuries cannot be justified. [...] [T]he military commander of territory held in belligerent occupation must balance between the needs of the army on one hand, and the needs of the local inhabitants on the other. In the framework of this delicate balance, there is no room for an additional system of considerations, whether they be political considerations, the annexation of territory, or the establishment of the permanent borders of the state. This Court has emphasized time and time again that the authority of the military commander is inherently temporary, as belligerent occupation is inherently temporary. Permanent arrangements are not the affair of the military commander. True, the belligerent occupation of the area has gone on for many years. This fact affects the scope of the military commander’s authority. [...] The passage of time, however, cannot extend the authority of the military commander and allow him to take into account considerations beyond the proper administration of the area under belligerent occupation. [...] We have no reason to assume that the objective is political rather than security-based. Indeed, petitioners did not carry the burden and did not persuade us that the considerations behind the construction of the separation fence are political rather than security-based. Similarly, petitioners did not carry their burden, and did not persuade us that the considerations of the Commander of the IDF Forces in the area, in choosing the route of the separation fence, are not military considerations, and that he has not acted to fulfill them in good faith, according to his best military understanding. The focus of this petition is the legality of the route chosen for construction of the separation fence. This question stands on its own, and it requires a straightforward, real answer. It is not sufficient that the fence be motivated by security considerations, as opposed to political considerations. The military commander is not at liberty to pursue, in the area held by him in belligerent occupation, every activity which is primarily motivated by security considerations. The discretion of the military commander is restricted by the normative system in which he acts, and which is the source of his authority. Indeed, the military commander is not the sovereign in the occupied territory. [...] He must act within the law which establishes his authority in a situation of belligerent occupation. What is the content of this law? The law of belligerent occupation recognizes the authority of the military commander to maintain security in the area and to protect the security of his country and her citizens. However, it imposes conditions on the use of this authority. This authority must be properly balanced against the rights, needs, and interests of the local population [...]. The first subtest is that the objective must be related to the means. The means that the administrative body uses must be constructed to achieve the precise objective which the administrative body is trying to achieve. The means used by the administrative body must rationally lead to the realization of the objective. This is the “appropriate means” or “rational means” test. According to the second subtest, the means used by the administrative body must injure the individual to the least extent possible. In the spectrum of means which can be used to achieve the objective, the least injurious means must be used. This is the “least injurious means” test. The third test requires that the damage caused to the individual by the means used by the administrative body in order to achieve its objectives must be of proper proportion to the gain brought about by that means. That is the “proportionate means” test (or proportionality “in the narrow sense.”) The test of proportionality “in the narrow sense” is commonly applied with “absolute values,” by directly comparing the advantage of the administrative act with the damage that results from it. However, it is also possible to apply the test of proportionality in the narrow sense in a “relative manner.” According to this approach, the administrative act is tested vis-à-vis an alternate act, whose benefit will be somewhat smaller than that of the former one. The original administrative act is disproportionate in the narrow sense if a certain reduction in the advantage gained by the original act – by employing alternate means, for example – ensures a substantial reduction in the injury caused by the administrative act. The principle of proportionality applies to our examination of the legality of the separation fence. This approach is accepted by respondents. [...] The proportionality of the separation fence must be decided by the three following questions, which reflect the three subtests of proportionality. First, does the route pass the “appropriate means” test (or the “rational means” test)? The question is whether there is a rational connection between the route of the fence and the goal of the construction of the separation fence. Second, does it pass the test of the “least injurious” means? The question is whether, among the various routes which would achieve the objective of the separation fence, is the chosen one the least injurious. Third, does it pass the test of proportionality in the narrow sense? The question is whether the separation fence route, as set out by the military commander, injures the local inhabitants to the extent that there is no proper proportion between this injury and the security benefit of the fence. According to the “relative” examination of this test, the separation fence will be found disproportionate if an alternate route for the fence is suggested that has a smaller security advantage than the route chosen by respondent, but which will cause significantly less damage than that original route. [...] Therefore, in our examination of the contrasting military considerations in this case, we give special weight to the fact that the commander of the area is responsible for security. Having employed this approach, we are of the opinion – the details of which we shall explain below – that petitioners have not carried their burden, and have not convinced us that we should prefer the professional expert opinion of members of the Council for Peace and Security over the security stance of the commander of the area. We are dealing with two military approaches. Each of them has military advantages and disadvantages. In this state of affairs, we must place the expert opinion of the military commander at the foundation of our decision. [...] The standard for this question is not the subjective standard of the military commander. The question is not whether the military commander believed, in good faith, that the injury is proportionate. The standard is objective. The question is whether, by legal standards, the route of the separation fence passes the tests of proportionality. This is a legal question, the expertise for which is held by the Court. The key question before us is [...]: is the injury caused to local inhabitants by the separation fence proportionate, or is it is possible to satisfy the central security considerations while establishing a fence route whose injury to the local inhabitants is lesser and, as such, proportionate? The separation fence which is the subject of this petition is approximately forty kilometers long. Its proportionality varies according to local conditions. We shall examine its proportionality according to the various orders that were issued for the construction of different parts of the fence. We shall examine the legality of the orders along the route of the fence from west to east. This route starts east of the town of Maccabim and the Beit Sira village. It continues south to the town of Mevo Choron, and from there continues east to Jerusalem. The route of the fence continues to wind, and it divides between Israeli towns and Palestinian villages adjacent to it. It climbs Jebel Muktam in order to ensure Israeli control of it. As such, it passes the villages of Beit Likia, Beit Anan, and Chirbet Abu ALahm. After that, it advances east, separating Ma’aleh HaChamisha and Har Adar from the villages of Katane, El Kabiba, and Bidu. The fence continues and circles the village of Beit Sourik, climbing northward until it reaches route 443, which is a major traffic route connecting Jerusalem to the center of the country. In its final part, it separates the villages Bidu, Beit Ajaza, and Beit Daku from Har Shmuel, New Giv’on, and Giv’at Ze’ev. These orders apply to more than ten kilometers of the fence route. This segment of the route surrounds the high mountain range of Jebel Muktam. This ridge topographically controls its immediate and general surroundings. It towers over route 443 which passes north of it, connecting Jerusalem to Modi’in. The route of the obstacle passes from southwest of the village of Beit Likia, southwest of the village of Beit Anan, and west of the village of Chirbet Abu A-Lahm. Respondent explains that the objective of this route is to keep the mountain area under Israeli control. This will ensure an advantage for the armed forces, who will topographically control the area of the fence, and it will decrease the capability of others to attack those traveling on route 443. From a military standpoint, there is a dispute between experts regarding the route that will realize the security objective. As we have noted, this places a heavy burden on petitioners, who ask that we prefer the opinion of the experts of the Council for Peace and Security [among them former Israeli generals] over the approach of the military commander. The petitioners have not carried this burden. We cannot – as those who are not experts in military affairs – determine whether military considerations justify laying the separation fence north of Jebel Muktam (as per the stance of the military commander) or whether there is no need for the separation fence to include it (as per the stance of petitioners’ and the Council for Peace and Security). Thus, we cannot take any position regarding whether the considerations of the military commander, who wishes to hold topographically controlling hills and thus prevent “flat-trajectory” fire, are correct, militarily speaking, or not. In this state of affairs, there is no justification for our interference in the route of the separation fence from a military perspective. Is the injury to the local inhabitants by the separation fence in this segment, according to the route determined by respondent, proportionate? Our answer to this question necessitates examination of the route’s proportionality, using the three subtests. The first subtest examines whether there is a rational connection between the objective of the separation fence and its established route. Our answer is that such a rational connection exists. [...] By our very ruling that the route of the fence passes the test of military rationality, we have also held that it realizes the military objective of the separation fence. The second subtest examines whether it is possible to attain the security objectives of the separation fence in a way that causes less injury to the local inhabitants. [...] The position of the military commander is that the route of the separation fence, as proposed by members of the Council for Peace and Security, grants less security than his proposed route. By our very determination that we shall not intervene in that position, we have also determined that there is no alternate route that fulfills, to a similar extent, the security needs while causing lesser injury to the local inhabitants. In this state of affairs, our conclusion is that the second subtest of proportionality, regarding the issue before us, is satisfied. The third subtest examines whether the injury caused to the local inhabitants by the construction of the separation fence stands in proper proportion to the security benefit from the security fence in its chosen route. This is the proportionate means test (or proportionality “in the narrow sense”). [...] According to this subtest, a decision of an administrative authority must reach a reasonable balance between communal needs and the damage done to the individual. The objective of the examination is to determine whether the severity of the damage to the individual and the reasons brought to justify it stand in proper proportion to each other. This judgment is made against the background of the general normative structure of the legal system, which recognizes human rights and the necessity of ensuring the provision of the needs and welfare of the local inhabitants, and which preserves “family honour and rights” (Regulation 46 of the Hague Regulations). All these are protected in the framework of the humanitarian provisions of the Hague Regulations and the Geneva Convention. The question before us is: does the severity of the injury to local inhabitants, by the construction of the separation fence along the route determined by the military commander, stand in reasonable (proper) proportion to the security benefit from the construction of the fence along that route? Our answer is that there [sic] relationship between the injury to the local inhabitants and the security benefit from the construction of the separation fence along the route, as determined by the military commander, is not proportionate. The route undermines the delicate balance between the obligation of the military commander to preserve security and his obligation to provide for the needs of the local inhabitants. This approach is based on the fact that the route which the military commander established for the security fence – which separates the local inhabitants from their agricultural lands – injures the local inhabitants in a severe and acute way, while violating their rights under humanitarian international law. Here are the facts: more than 13,000 farmers (falahin) are cut off from thousands of dunams of their land and from tens of thousands of trees which are their livelihood, and which are located on the other side of the separation fence. No attempt was made to seek out and provide them with substitute land, despite our oft[en] repeated proposals on that matter. The separation is not hermetic: the military commander announced that two gates will be constructed, from each of the two villages, to its lands, with a system of licensing. This state of affairs injures the farmers severely, as access to their lands (early in the morning, in the afternoon, and in the evening), will be subject to restrictions inherent to a system of licensing. Such a system will result in long lines for the passage of the farmers themselves; it will make the passage of vehicles (which themselves require licensing and examination) difficult, and will distance the farmer from his lands (since only two daytime gates are planned for the entire length of this segment of the route). As a result, the life of the farmer will change completely in comparison to his previous life. The route of the separation fence severely violates their right of property and their freedom of movement. Their livelihood is severely impaired. The difficult reality of life from which they have suffered (due, for example, to high unemployment in that area) will only become more severe. These injuries are not proportionate. They can be substantially decreased by an alternate route, either the route presented by the experts of the Council for Peace and Security, or another route set out by the military commander. Such an alternate route exists. It is not a figment of the imagination. It was presented before us. It is based on military control of Jebel Muktam, without “pulling” the separation fence to that mountain. Indeed, one must not forget that, even after the construction of the separation fence, the military commander will continue to control the area east of it. In the opinion of the military commander – which we assume to be correct, as the basis of our review – he will provide less security in that area. However, the security advantage reaped from the route as determined by the military commander, in comparison to the proposed route, does not stand in any reasonable proportion to the injury to the local inhabitants caused by this route. Indeed, the real question in the “relative” examination of the third proportionality subtest is not the choice between constructing a separation fence which brings security but injures the local inhabitants, or not constructing a separation fence, and not injuring the local inhabitants. The real question is whether the security benefit reaped by the acceptance of the military commander’s position (that the separation fence should surround Jebel Muktam) is proportionate to the additional injury resulting from his position (with the fence separating local inhabitants from their lands). Our answer to this question is that the military commander’s choice of the route of the separation fence is disproportionate. The gap between the security provided by the military commander’s approach and the security provided by the alternate route is minute, as compared to the large difference between a fence that separates the local inhabitants from their lands, and a fence which does not separate the two (or which creates a separation which is smaller and possible to live with). Indeed, we accept that security needs are likely to necessitate an injury to the lands of the local inhabitants and to their ability to use them. International humanitarian law on one hand, however, and the basic principles of Israeli administrative law on the other, require making every possible effort to ensure that injury will be proportionate. Where construction of the separation fence demands that inhabitants be separated from their lands, access to these lands must be ensured, in order to minimize the damage to the extent possible. This order applies to the five and a half kilometer long segment of the route of the obstacle which passes west and southeast of the villages of Beit Sourik (population: 3500) and Bidu (population: 7500). A study of this part of the route, as published in the original order, reveals that the injury to these villages is great. From petitioners’ data – which was not negated by respondents – it appears that 500 dunams of the lands of the village of Beit Sourik will be directly damaged by the positioning of the obstacle. 6000 additional dunams will remain beyond it (5000 dunams of which are cultivated land), including three greenhouses. Ten thousand trees will be uprooted and the inhabitants of the villages will be cut off from 25,000 thousand olive trees, 25,000 fruit trees and 5400 fig trees, as will as from many other agricultural crops. These numbers do not capture the severity of the damage. We must take into consideration the total consequences of the obstacle for the way of life in this area. The original route as determined in the order leaves the village of Beit Sourik bordered tightly by the obstacle on its west, south, and east sides. This is a veritable chokehold, which will severely stifle daily life. The fate of the village of Bidu is not much better. The obstacle surrounds the village from the east and the south, and impinges upon lands west of it. From a study of the map attached by the respondents (to their response of March 10, 2004) it appears that, on this segment of the route, one seasonal gate will be established south of the village of Beit Sourik. In addition, a checkpoint will be positioned on the road leading eastward from Bidu. In addition to the parties’ arguments before us, a number of residents of the town of Mevasseret Tzion, south of the village of Beit Sourik, asked to present their position. They pointed out the good neighborly relations between Israelis and Palestinians in the area and expressed concern that the route of the fence, which separates the Palestinian inhabitants from their lands, will put those relations to an end. They argue that the Palestinians’ access to their lands will be subject to a series of hindrances and violations of their dignity, and that this access will even be prevented completely. On the other hand, Mr. Efraim Halevi asked to present his position, which represents the opinion of other residents of the town of Mevasseret Tzion. He argues that moving the route of the fence southward, such that it approaches Mevasseret Tzion, will endanger its residents. As with the previous orders, here too we take the route of the separation fence determined by the military commander as the basis of our examination. We do so, since we grant great weight to the stance of the official who is responsible for security. The question which arises before us is: is the damage caused to the local inhabitants by this part of the separation fence route proportionate? Here too, the first two subtests of the principle of proportionality are satisfied. Our doubt relates to the satisfaction of the third subtest. On this issue, the fact is that the damage from the segment of the route before us is most severe. The military commander himself is aware of that. During the hearing of the petition, a number of changes in the route were made in order to ease the situation of the local inhabitants. He mentioned that these changes provide an inferior solution to security problems, but will allow the injury to the local inhabitants to be reduced, and will allow a reasonable level of security. However, even after these changes, the injury is still very severe. The rights of the local inhabitants are violated. Their way of life is completely undermined. The obligations of the military commander, pursuant to the humanitarian law enshrined in the Hague Regulations and the Fourth Geneva Convention, are not being satisfied. The Council for Peace and Security proposed an alternate route, whose injury to the agricultural lands is much smaller. It is proposed that the separation fence be distanced both from the east of the village of Beit Sourik and from its west. Thus, the damage to the agricultural lands will be substantially reduced. We are convinced that the security advantage achieved by the route, as determined by the military commander, in comparison with the alternate route, is in no way proportionate to the additional injury to the lives of the local inhabitants caused by this order. There is no escaping the conclusion that, for reasons of proportionality, this order before us must be annulled. The military commander must consider the issue again. [...] This is the military commander’s affair, subject to the condition that the location of the route free the village of Beit Sourik (and to a lesser extent, the village of Bidu) from the current chokehold and allow the inhabitants of the villages access to the majority of their agricultural lands. Having completed the examination of the proportionality of each order separately, it is appropriate that we lift our gaze and look out over the proportionality of the entire route of the part of the separation fence which is the subject of this petition. The length of the part of the separation fence to which these orders apply is approximately forty kilometers. It causes injury to the lives of 35,000 local inhabitants. 4000 dunams of their lands are taken up by the route of the fence itself, and thousands of olive trees growing along the route itself are uprooted. The fence separates the eight villages in which the local inhabitants live from more than 30,000 dunams of their lands. The great majority of these lands are cultivated, and they include tens of thousands of olive trees, fruit trees and other agricultural crops. The licensing regime which the military commander wishes to establish cannot prevent or substantially decrease the extent of the severe injury to the local farmers. Access to the lands depends upon the possibility of crossing the gates, which are very distant from each other and not always open. Security checks, which are likely to prevent the passage of vehicles and which will naturally cause long lines and many hours of waiting, will be performed at the gates. These do not go hand in hand with the farmer’s ability to work his land. There will inevitably be areas where the security fence will have to separate the local inhabitants from their lands. In these areas, the commander should allow passage which will reduce, to the extent possible, the injury to the farmers. During the hearings, we asked respondent whether it would be possible to compensate petitioners by offering them other lands in exchange for the lands that were taken to build the fence and the lands that they will be separated from. We did not receive a satisfactory answer. This petition concerns farmers that make their living from the land. Taking petitioners’ lands obligates the respondent, under the circumstances, to attempt to find other lands in exchange for the lands taken from the petitioners. Monetary compensation may only be offered if there are no substitute lands. The injury caused by the separation fence is not restricted to the lands of the inhabitants and to their access to these lands. The injury is of far wider a scope. It strikes across the fabric of life of the entire population. In many locations, the separation fence passes right by their homes. In certain places (like Beit Sourik), the separation fence surrounds the village from the west, the south and the east. The fence directly affects the links between the local inhabitants and the urban centers (Bir Nabbala and Ramallah). This link is difficult even without the separation fence. This difficulty is multiplied sevenfold by the construction of the fence. The task of the military commander is not easy. He must delicately balance between security needs and the needs of the local inhabitants. We were impressed by the sincere desire of the military commander to find this balance, and his willingness to change the original plan in order to reach a more proportionate solution. We found no stubbornness on his part. Despite all this, we are of the opinion that the balance determined by the military commander is not proportionate. There is no escaping, therefore, a renewed examination of the route of the fence, according to the standards of proportionality that we have set out. Our task is difficult. We are members of Israeli society. Although we are sometimes in an ivory tower, that tower is in the heart of Jerusalem, which is not infrequently hit by ruthless terror. We are aware of the killing and destruction wrought by the terror against the state and its citizens. As any other Israelis, we too recognize the need to defend the country and its citizens against the wounds inflicted by terror. We are aware that in the short term, this judgment will not make the state’s struggle against those rising up against it easier. But we are judges. When we sit in judgment, we are subject to judgment. We act according to our best conscience and understanding. Regarding the state’s struggle against the terror that rises up against it, we are convinced that at the end of the day, a struggle according to the law will strengthen her power and her spirit. There is no security without law. Satisfying the provisions of the law is an aspect of national security. [...] Only a separation fence built on a base of law will grant security to the state and its citizens. Only a separation route based on the path of law, will lead the state to the security so yearned for. The result is that we reject the petition against order no. Tav/105/03. We accept the petition against orders Tav/104/03, Tav/103/03, Tav/84/03 (western part), Tav/107/03, Tav/108/03, Tav/109/03, and Tav/110/03 (to the extent that it applies to the lands of Beit Daku), meaning that these orders are nullified, since their injury to the local inhabitants is disproportionate. Respondents will pay 20,000 NIS in petitioners’ costs. Held, as stated in the opinion of President A. Barak. Alfei Menashe is an Israeli town in the Samaria area. It was established approximately four kilometers beyond the Green Line. Pursuant the military commander’s orders, a separation fence was built, surrounding the town from all sides, and leaving a passage containing a road connecting the town to Israel. A number of Palestinian villages are included within the fence’s perimeter. The separation fence cuts them off from the remaining parts of the Judea and Samaria area. An enclave of Palestinian villages on the “Israeli” side of the fence has been created. Petitioners are residents of the villages. They contend that the separation fence is not legal. This contention of theirs is based upon the judgment in The Beit Sourik Case […] [See Part B of this case]. The petition also relies upon the Advisory Opinion of the International Court of Justice at the Hague […] [See Part A of this case]. Is the separation fence legal? That is the question before us. The Alfei Menashe enclave – the topic of the petition before us – is part of phase A of the fence. The decision regarding it was reached on June 23 2002. The construction of the fence was finished in August 2003. The fence circumscribes Alfei Menashe (population approximately 5650) and five Palestinian villages (population approximately 1200) […]. Petitioners contend that the separation fence is not legal, and should be dismantled. They argue that the military commander is not authorized to give orders to construct the separation fence. That claim is based on the Advisory Opinion of the International Court of Justice at the Hague (hereinafter also “ICJ”). Petitioners also contend that the separation fence does not satisfy the standards determined in The Beit Sourik Case. On this issue, petitioners argue that the fence is disproportionate and discriminatory. […] On the merits, respondents argue that the military commander is authorized to erect a separation fence, as ruled in The Beit Sourik Case. The Advisory Opinion of the International Court of Justice at the Hague makes no difference in this regard, since it was based upon a factual basis different from that established in The Beit Sourik Case. Respondents also contend that the injury to the Palestinian residents satisfies the standards determined in The Beit Sourik Case. “The Israeli settlement in the Gaza Strip is controlled by the law of belligerent occupation. Israeli law does not apply in this area . . . the lives of the settlers are arranged, mainly, by the security legislation of the military commander. The military commander’s authority ‘to ensure public order and safety’ is directed towards every person present in the area under belligerent occupation. It is not restricted to ‘protected persons’ only . . . this authority of his covers all Israelis present in the area” […]. Indeed, the military commander must ensure security. He must preserve the safety of every person present in the area of belligerent occupation, even if that person does not fall into the category of ‘protected persons’ […]. “Alongside the area commander’s responsibility for safeguarding the safety of the military force under his command, he must ensure the well being, safety and welfare of the residents of the area. This duty of his applies to all residents, without distinction by identity – Jew, Arab, or foreigner. The question of the legality of various populations’ settlement activity in the area is not the issue put forth for our decision in this case. From the very fact that they have settled in the area is derived the area commander’s duty to preserve their lives and their human rights. This sits well with the humanitarian aspect of the military force’s responsibility in belligerent occupation” […]. Indeed, the legality of the Israeli settlement activity in the area does not affect the military commander’s duty – as the long arm of the State of Israel – to ensure the life, dignity and honor, and liberty of every person present in the area under belligerent occupation […]. Even if the military commander acted in a manner that conflicted the law of belligerent occupation at the time he agreed to the establishment of this or that settlement – and that issue is not before us, and we shall express no opinion on it – that does not release him from his duty according to the law of belligerent occupation itself, to preserve the lives, safety, and dignity of every one of the Israeli settlers. The ensuring of the safety of Israelis present in the area is cast upon the shoulders of the military commander […]. “Israel has the duty to protect her citizens. She does not satisfy her duty merely since citizens are willing to ‘take the risk upon themselves’. This ‘taking of risk’ does not add or detract from the issue, as the state remains obligated to the well being of its citizens, and must do everything possible to return them safely to the country” […]. Thus it is, generally speaking. Thus it certainly is, when many of the Israelis living in the area do so with the encouragement and blessing of the government of Israel. Are the Hague Regulations and GC IV applicable to the Palestinian territories? According to the International Court of Justice (ICJ)? According to the Israeli High Court of Justice (HCJ)? Which para. of GC IV, Art. 2 (para. 1 or para. 2) is decisive for the ICJ’s conclusion as to the applicability of GC IV? (ICJ, para. 1) How can the General Assembly resolution reaffirm the applicability of Protocol I while Israel is not a party to that treaty? Does the ICJ apply Protocol I? If it had done so, would its conclusions have been different? (ICJ, para. 91) In which sense is the unilateral undertaking given by the declaration of 7 June 1982 to respect GC IV valid? Does it make Palestine a State party to GC IV? Has this undertaking any impact on the outcome of the case before the HCJ? Are all provisions of GC IV still applicable in the Palestinian territories, or only those referred to in Art. 6(3)? Have all military operations in the territories ceased? Does the construction of the wall/fence amount to an annexation? According to the ICJ? According to the HCJ? Would such an annexation be contrary to IHL? What does the ICJ say about this? Would the HCJ have found the wall/fence illegal if its route had been influenced by anything other than security considerations? May an occupying power take into account the security of its own population on its national territory? That of inhabitants of settlements? On what basis does the HCJ come to the conclusion that no political or Zionist considerations influenced the route of the wall? Does the fact that it does not follow the “Green Line” argue in favour of the opposite conclusion? (ICJ, Separate Opinion of Judge Higgins, paras 23 and 24) Does the ICJ explain why the wall/fence violates Arts 47, 49, 52, 53 and 59 of GC IV? Can you explain this for each of these provisions? Do you agree with Judge Higgins’ criticism? Explain why the destruction and requisition of private property contravene the requirements of Arts 46 and 52 of the Hague Regulations and of Art. 53 of GC IV. Is this conclusion correct even if the facts are those described by the HCJ (HCJ, Beit Sourik, para. 8)? Do you agree with Judge Buergenthal’s criticism (ICJ, Declaration of Judge Buergenthal)? (ICJ, paras 135-137) Which of the provisions mentioned by the ICJ are subject to derogations if military exigencies so require? Are military exigencies and military operations equivalent? Why is the destruction of private property necessary to build the wall not permitted under Art. 53 of GC IV? May an occupying power seize land for the needs of its army? For security reasons? Why does the HCJ say that the Israelis living in Palestinian territories are not “protected persons” according to GC IV? What is their status? Are they protected by IHL at all? Do you agree with the HCJ that Art. 43 of the Hague Regulations applies to the Israeli settlers living in Palestinian territories? What does the duty to “restore, and ensure, as far as possible, public order and safety” entail? Does it include the protection of the settlers, who arrived after the occupation began? Do you think that protecting Israeli settlements in Palestinian territories will contribute to restoring or ensuring public order and safety in the West Bank? (ICJ, para. 120) Why are Israeli settlements in the Palestinian territories prohibited? Does every establishment of an Israeli citizen in the Palestinian territories violate IHL? Is the fact that Israeli settlements are included within the wall decisive for the conclusion that it contravenes IHL? For the ICJ? For Judge Buergenthal? In your opinion? Does the HCJ deal with the prohibition of settlements? Why not? Isn’t it a humanitarian rule of GC IV? May Israel protect the lives of settlers in the occupied territories? Does it even have a duty under IHL to protect its citizens living in Palestinian territories? Even if those citizens were transferred unlawfully into the occupied territory? May it only protect their lives, or also their continued presence in the occupied territories? Wouldn’t it be contradictory for IHL to protect settlements that it prohibits? Is the HCJ saying that GC IV applies to the Palestinian territories? Why does it refer to GC IV, whereas Israel has always denied its de jure application? (ICJ, Declaration of Judge Buergenthal, para. 9) Do you agree with Judge Buergenthal that, as the settlements are illegal under international law, any measure to protect them, including the construction of the wall/fence, is necessarily illegal? Does Israeli law apply in the occupied territories? What does the Court say in this regard (HCJ, Mara’abe, para. 22)? May the protection of Israeli citizens in the occupied territories be based on Israel’s Basic Laws and its common law? Do you agree with the HCJ’s definition of proportionality? With the application of that definition to the facts? Does the HCJ consider that a route for the wall/fence less injurious for Palestinians exists? Does it therefore consider that the present route is disproportionate? Would the HCJ consider the route disproportionate if the security interests and the injury to Palestinians were the same, but no alternative route existed? Does the HCJ consider that if a measure violating IHL is proportionate, it is admissible? Does the ICJ refer at all to the question of proportionality? In the context of IHL or of international human rights law? Is international human rights law applicable in armed conflicts? If yes, how do you determine whether that law or IHL prevails if they are contradictory? Does international human rights law apply in an occupied territory? Are the reasons the same for the International Covenant on Civil and Political Rights, the International Covenant on Economic, Social and Cultural Rights and the Convention on the Rights of the Child? According to the ICJ? In your opinion? Are all provisions of human rights treaties fully applicable during an armed conflict? Are derogations due to the exigencies of the situation only admissible so long as they are officially declared? Are the human rights mentioned by the ICJ also protected by IHL in occupied territories? Which are not protected by the latter? Are there any contradictions between those human rights and IHL? Does international human rights law provide for freedom of movement in an occupied territory? Is such freedom compatible with IHL? Does international human rights law lead the ICJ to any conclusion in this case which it would not have reached under IHL? Does the HCJ apply international human rights law? Can the right to self-defence or a state of necessity justify violations of IHL? Of international human rights law? According to the ICJ? The HCJ? In your opinion? What are the legal consequences of the illegality of the wall/fence for Israel? According to the ICJ? According to the HCJ? What are the legal consequences of the illegality of the wall/fence for third States? Do all rules of IHL have an erga omnes character? What is the impact of such an erga omnes character? Does common Art. 1 mean that third States must ensure respect for IHL by Israel? Does it simply confirm the erga omnes character of IHL rules, or does it also have an additional meaning? Do you agree with the criticism by Judge Koojimans and Professor Kalshoven of this interpretation of common Art. 1? In practice, what is meant by the obligation for third States not to recognize the illegal situation resulting from the construction of the wall/fence? What about their obligation not to render aid or assistance in maintaining the situation created by such a construction? What are the reasons for such obligations? What measures must third States take to ensure that the wall/fence is not built? Are there any limitations to those measures? Do you agree with Judge Koojimans’ criticism of operative subpara. (3)(D) of the ICJ decision? Does Judge Buergenthal consider that the construction of the wall/fence does not violate IHL? Is Judge Higgins right that the ICJ should also have dealt with the broader context, i.e. the suicide attacks by Palestinians on Israeli civilians? Do those attacks violate IHL? Could such violations have led to different conclusions by the ICJ? If the ICJ had attributed those attacks to the Palestinian Authority? (HCJ, Beit Sourik, para. 86) Do you agree with the HCJ that there is no security without law and that satisfying the provisions of the law is an aspect of national security? If yes, explain why.